Pearson correlation, the most common type of correlation, is widely used in Data Science. However incorrect conclusions are often drawn from a low or high correlation. We will see below some counterexamples, hoping that they will help to better remember some limitations of the Pearson correlation. A low correlation means that there is no relationship between two sequences WRONG! We see that the Pearson correlation has a very small absolute value: 0.05. However, both sequences can be exactly computed from the other. A high correlation means that we should be able to approximately predict one sequence from the other WRONG! 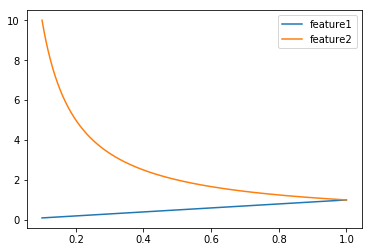 As we can see, feature1 and feature2 are highly correlated, their Pearson correlation being equal to 0.98. However, both sequences are obtained by accumulating random numbers and therefore one sequence cannot be predicted from the other. a low correlation between two sequences while one sequence can be exactly predicted from the other.